Club Tijuana and the Red Bulls entering the field. Photo by Jason Schott. The Red Bulls, after falling behind early, rallied to a 3-1 win over Club Tijuana on Tuesday night at Red Bull Arena in the second leg of their CONCACAF Champions League Quarterfinal matchup. This result coupled with the Red Bulls' 2-0 win in Mexico last Tuesday, means they advance on the 5-1 aggregate. The Red Bulls are now in the Scotiabank CONCACAF Champions League Semifinals for the first time in club history. The win secures a home match in the second leg of the semifinals against the winner of the Seattle/Guadalajara series, which has the second leg tomorrow night. The Red Bulls have become the third MLS team in league history to advance in a knockout round of the SCCL tournament against a Liga MX opponent since 2008. Previously, Seattle advanced against Tigres in 2012-13, and Montreal won a series against Pachuca on away goals after two draws in 2014-15. Tijuana came out firing in this one, as Luis Mendoza hit the post two minutes into the game. Mendoza would get his redemption in the 10th minute. The play started with a long pass from Rubio Rubin, then was knocked down by Damian Perez coming down the left side, and he fired it to Mendoza, who simply let it deflect off his right shoe into the net for a 1-0 lead. Tijuana kept the pressure up, and in the 24th minute, Jose Alberto Garcia fired one off the crossbar. That would have tied the aggregate at 2. A few minutes later, Tijuana got another golden chance, which Red Bulls goalkeeper Luis Robles kicked out. Bradley Wright-Phillips ended up with it, and he calmly moved up the field, deep into Tijuana territory. He dropped it off to Anthony Murillo coming down the right side, and he sent it into the box, where Tyler Adams drilled it to tie the game at 1 and make it 3-1 Red Bulls on aggregate. That really took the wind out of Tijuana's sails, and from that point on, it was all Red Bulls. In the 70th minute, Murillo corralled a quick-moving pass along the right sideline, and he dribbled toward the net. He dropped it off to Florian Valot, who sent it back to Murillo in the right corner, and Murillo sent it to Wright-Phillips at the top right corner of the crease. BWP then found Marc Rzatkowski coming down the left side, and he drilled it to make it 2-1 Red Bulls on the night. That really was a beautiful play, and the fact it involved two newcomers, Rzatkowski and Valot, made it that much more important. For Valot, it was his first career first team start with the Red Bulls, getting the call over Sean Davis, who was suspended due to yellow card accumulation. 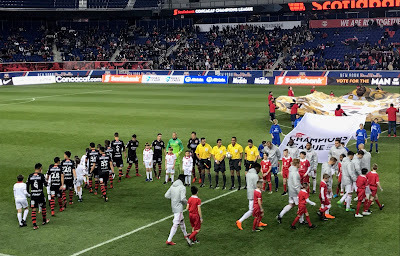 Not much later, BWP was at it again, as he took the ball from a Tijuana player by the center line, raced down the right side, and sent a pass into the box to Alejandro Romero Gamarra, known as Kaku, and he drilled it to make it 3-1 on the night and an insurmountable 5-1 in aggregate in the 78th minute. Wright-Phillips recorded three assists on the night, the first time he has done that as a Red Bull. BWP has recorded a point in five straight-straight matches across all competitions. Through the first five matches of 2018, BWP has tallied four goals and five assists. Since Red Bull Arena was constructed in 2010, they have stretched their unbeaten SCCL streak at RBA to seven matches (5-0-2). The Red Bulls also extended its unbeaten streak across all competitions to five matches and have outscored their opponents, 12-2.They have scored at least two goals in four consecutive matches across all competitions. The Red Bulls have scored a goal in its first five matches of 2018 (four in Champions League, one in MLS). They have tallied at least one goal in nine consecutive matches, dating back to last season. The last time New York was held scoreless was on Oct. 15, 2017 against Atlanta United in a 0-0 draw. The Red Bulls return to MLS play this weekend when they are at Real Salt Lake on Saturday at 9 pm.